Tevin Farmer, the “American Idol”, continued his march toward a world title fight in 2015, and one of his three appearances during the year was the best among all Philly-based fighters. 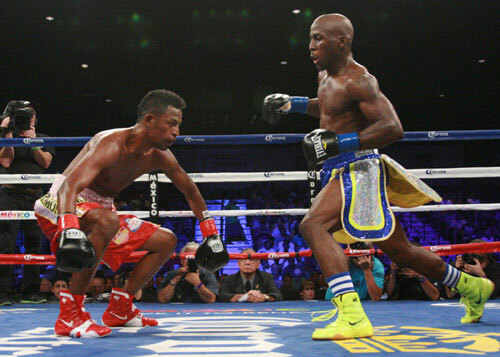 On August 8, 2015, Farmer took on Daulis Prescott of Columbia, at the Fantasy Springs Casino in Indio, CA. The scheduled 10-rounder was televised by HBO-Latino, and presented Farmer with his most experienced opponent to date. 38-bout vet Prescott challenged Nicholas Walters for a world title in 2012, and was considered the favorite against Tevin. However, Farmer, flying high since his 2013 career turnaround, had steadily improved and built his confidence brick by brick. By the time he stepped into the ring with Prescott, the Columbian didn’t stand a chance. Farmer overwhelmed his foe, dropping him in rounds four, six, and finally in the eighth, with a crushing left that ended the bout on the spot. It was a scorching performance by Farmer and was a perfect indication of just how good he truly is. Farmer kept winning this year and is close to landing a career-changing fight. The “2015 Performance of the Year” award is sponsored by Philly Boxing History. 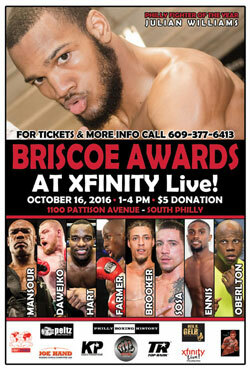 Come out to support Tevin Farmer, the other winners and the rest of the Philly boxing community on Sunday, October 16, 2016, 1-4 pm at Xfinity Live! In South Philadelphia. Admission is $5.